Great combat and mountains of loot cant compensate for Amalurs generic world design and familiar story. As with so many longform fantasy RPGs, the troubles afflicting the inhabitants of Amalur can all be blamed on the actions of a single mad gnome. Stupid gnomes. This time one of them has decided to build a device called the Well of Souls to bring people back from the dead. You, a third-person fantasy hero, are its first and last success. The device is conveniently exploding when you wake up, so your first task is simply to escape the collapsing caverns that house it. Next thing you know, you're in the Faelands, an idyllic realm under threat from a mad elf king and the dark god he's trying to summon. You must save the land. This being a combat-driven RPG, you must do so by hitting things. Lots of things. Returning from the dead has its consequences, however. You're not a zombie in the grey, smelly, decomposing sense, but being alive when you shouldn't be has supposedly jolted your character out of the grooves of fate that determine the life and death of every creature in Amalur, giving you the ability to change the fate of those around you. That's the theory, at least. In reality, at points in the story you're told that by dicing-up a murderous creature you've saved the lives of those it was 'destined' to kill. But as these moments are entirely dictated by the linear plot, your ability to mess with fate never has any real impact on the world. You mostly just hit things. But while you can't actually wreak havoc on the natural order, your alleged ability to do so attracts the interest of the great and powerful in the land. It's not long before you're recruited by the leader of the good Fae, the king of Summer, and sent off on a journey east to the crystal palace built by the evil king of Winter, leader of the bad Fae, to thwart his crazy plan. Getting to him will take a long, long time. Your quest will take you through a series of wide open zones, each of which contains a central hub town. These vary from small clusters of huts to small forts, and all contain half a dozen villagers standing under yellow exclamation marks, ready to send you on quests to slay monsters or retrieve valuable items from the surrounding wilds. You can choose to follow the main quest strand, which leads you on a linear path through the Faelands, or to linger and take your pick from a number of dull sidequests. 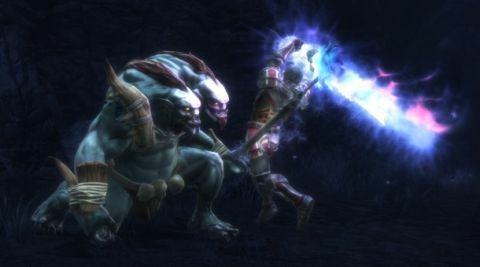 Alternatively, you can join one of Amalur's five factions, and complete their individual storylines for greater rewards. Whatever you decide to do, it will involve hitting a lot of monsters, and hitting monsters is what Amalur does best. Three skill trees are gradually unlocked as you slay foes and complete quests for experience. Might will give you more attacks with longswords, greatswords and five-foot mallets. The finesse tree will let you sneak more effectively, and make you more efficient with knives. The magic tree will unlock powerful spells and increase your damage with chakrams: sharp circular boomerangs designed to keep enemies at range. You can further specialise in sneaking, smashing or spellcasting by equipping the relevant destiny card. These will further boost relevant skills, increasing melee damage if you're a fighter and improving your mana pool as a spellcaster. It's a flexible system. You can visit NPCs to reset skill points and equip a different destiny card wherever you are to instantly change your speciality. As you grow more powerful, you'll unlock dual-class destinies that let you wield a wider range of weapons more effectively. Amalur's willingness to let you try out all its toys is one of its best points. All of its weapons are fun to play with, and high-level magic can be supremely satisfying. You'll commonly fight groups of half a dozen enemies. Your weapon swings are tied to the left mouse button, special abilities such as spells to the right. The latter can be switched by selecting different abilities from a taskbar. Judicious amounts of rolling and blocking are needed to dodge attacks and set up your combos. With a few skill points in the right tree, melee weapons gain charged-up heavy blows and new combos from rolling and blocking stances. If you chain these attacks just right, you can keep your enemies in the air for the entire fight. As a longsword specialist I'd commonly knock a foe flying with an upsweep, keep them in the air with a series of slashes, and then spike them with a magical ground stomp. This causes great rocky spines to explode from the earth, an effect that can be chained several times, triggering shockwaves to stun nearby enemies. If you prefer a more acrobatic style, the crescent-shaped Faeblades can be wielded with blinding speed. Magic is more sluggish, but deadly. Mystic staffs give off waves of elemental energy when swung. These keep enemies at bay as you wind up devastating shock spells to finish them off. Advanced spells can draw all of the enemies in the room into one place, the perfect precursor to the awesome meteor strike spell, which drops a great hunk of space junk on their heads. If you get into trouble, you can activate your fate gauge, which slowly fills with each kill. When this is full you can slow time to obliterate a field of enemies in moments, and execute the last one for a big XP boost. It's a good way to win tricky boss fights. Stealth is comparatively weak. You adopt a sneaky stance to creep through dungeons unseen; as you tiptoe close to enemies, their awareness meter will fill. If it maxes out, they attack. With enough skill invested in sneaking, you can get close enough to execute enemies with a showy stab. It works as it should, but sneaking around dungeons and picking off enemies just isn't as fun as dropping a meteor on them. A few other things niggle. The tendency for your character to get trapped in combos while attacks are coming in can be frustrating, as can the interruption and knockback attacks that some enemies will constantly spam your way. For the most part, it's a decent, satisfying combat system, but alone it can't sustain Amalur for the 30+ hours it'll take to finish the game. Expect to find a lot of loot as you wander the world. If you can't stop yourself from clicking on sparkly things that may contain treasure, Amalur will feel like the seventh circle of OCD hell. Every road is lined with flowers that can be harvested to make stat-buffing potions. Almost every enemy drops loot, and there are chests everywhere. There's a gem socketing system, too, which will let you combine found crystals into magical stones that can be put into your armour and weapons. The constant trickle of new armour and weaponry is addictive for a while, and there are plenty of ways to tweak your character for combat, but this can't liven up the bland world you're fighting through, or add any depth to the story. A few interesting ideas hide behind the passable dialogue and occasionally horrible voice acting you'll encounter as you move from zone to zone. The elfin Fae, for example, achieve immortality by reliving ballads over and over. If bad guys get hold of their stories, they can upset the order of their society with an unscheduled pot twist. The idea of playing a character free from fate is nice, too. But straightforward quests, predictable cartoon character design and lack of choice prevent these touches from becoming anything more. For a character whose greatest talent is the ability to change his own fate, you make few decisions with any lasting consequences. Big decisions at the end of faction questlines offer the illusion of choice, but without changing the world in a meaningful way. Beyond wiping out its wildlife, there aren't many opportunities to leave your mark on Amalur. There's something rigid and mechanical about the way quests are dished out in clumps, too. I found myself clearing zones as I would in an MMO, turning in batches of completed missions as fast as possible so I could quickly move on and see something new. Above all, Kingdoms of Amalur is too long. With a faster main quest and the wildlife-slaying filler quests removed, the scenery would change faster and progression feel less like a grind. More care could have been taken in making each area feel interesting. The Faeland's verdant forests, sunny plains and deserts are pretty, but always derivative. It just doesn't feel like a place where people live, and there's no sense of discovery to exploring its lands.